Riverside chiropractor Dr. Lynn Scecina is well-known throughout the area for her vast experience and expertise in using the Activator Technique. This technique is so gentle that it can be used safely on newborn babies, small children and the elderly, while also being extremely effective on bigger, stronger adults as well. Dr. Lynn Scecina has earned the Advanced Proficiency level of training for the Activator Methods Chiropractic Technique, and is one of the only chiropractors in Riverside qualified to offer this treatment. You lie down on a comfortable, padded chiropractic table. Dr. Scecina measures the length of your legs in various positions and asks you to occasionally move your arms or head. Subluxations (vertebral misalignments) are often characterized by uneven leg length. These guided movements will verify the specific vertebrae that need adjusting. Our Riverside chiropractor then places the rubber tip of the Activator at the correct location and angle to direct a very precise, gentle thrust directly to the affected vertebrae. This brings the vertebrae back into alignment, relieving any pinched nerves, to alleviate pain and dysfunction. During the course of the appointment, Dr. Scecina may ask you to move your legs, arms or head again, between Activator applications. As the appointment progresses, leg length should be balanced and the mechanics of your body will improve, for welcome pain relief and optimal wellness. Our Riverside wellness chiropractor can discuss any of your health and well-being concerns with you to determine whether chiropractic care, using the Activator Technique in particular, is right for your needs. Dr. Scecina is concerned about your total health and wellness picture, not just the one or two health concerns that may be manifesting symptoms. With this in mind, she can help design a comprehensive recovery and wellness plan tailored to your individual needs. 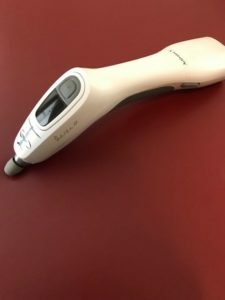 The Activator Technique has been thoroughly researched and has successfully provided relief for patients of all ages for more than four decades. Reach out to us at Woodcrest Chiropractic in Riverside to schedule an appointment and experience how the Activator Technique can boost your healing and wellness. Our friendly staff is available by calling 951-780-8833.